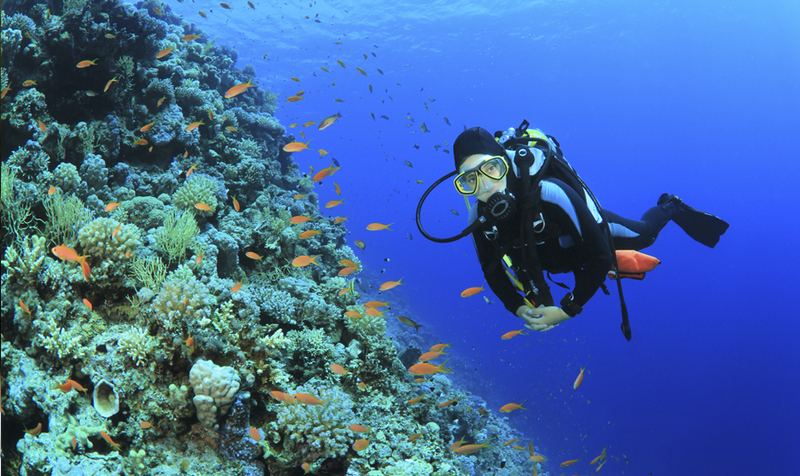 Monterey, CA is a world-class diving paradise that draws diving enthusiasts from around the world to explore the majestic underwater world of the Monterey Bay National Marine Sanctuary. Divers can explore the bay’s legendary giant kelp forests, swim with local marine wildlife, like sea otters and harbor seals and discover delightful underwater colonies of unusual fish, rare marine plants and protected sea mammals. Monterey Bay’s cool waters are home to a diversity of wildlife, which thrives in the protected habitats and nutrient rich water. Divers can spot animals like jellyfish, sea stars, anemones, sea cucumbers, corals, and fish of all species making their permanent homes in the bay, or experience unforgettable encounters with whales, porpoises, dolphins, and sharks traveling through the area on their annual migrations. San Carlos Beach is one of most popular diving spots in Monterey. The breakwater at San Carlos Beach is notable for its underwater relics of Monterey’s once prolific canning industry – now reduced to old pipes and abandoned foundations – that make an ideal home for local fish and underwater wildlife. Sea lions and harbor seals like to rest in and around the rocks of the sea wall at San Carlos Beach. A little further offshore, discover the bay’s awe-inspiring fields of giant plumose anemone. Visit www.aquariusdivers.com for information on scuba diving tours and diving rentals in Monterey.